We’re really getting into our letters! 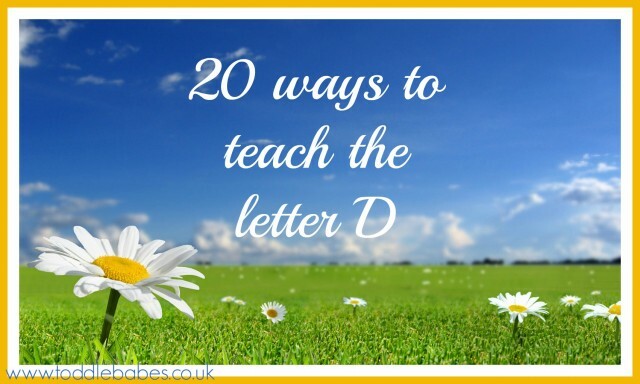 This week, it is the letter D. I do hope you’re enjoying using some of the ideas in my previous How to teach posts. I know my youngest is having a great time learning his letters. He even asks me when he can do the next one! As always, I promise a variety of ways to teach tis sound so am pretty sure you’ll find at least one activity that will suit your child’s learning style. Make a collection of items beginning with d, place them in a box. sneak an item NOT beginning with d into the box and ask your child to find the offending item. Provide writing sheets for your child to trace over the letter shape with finger/crayon/felt tip etc. If you can laminate them, then use a dry-wipe pen for repeated use. Cut out a large letter d (lowercase) and a small circle for the head and some triangle-like shapes for the spine…make a dinosaur by sticking the circle at the top of the d and the triangles along the rounded back of the letter. Make a duck out of a capital letter D. cut orange feet shapes, a beak, a small wing and head shape and stick it onto a D cutout or drawing on paper. Write D id for Daddy along the top of a sheet of paper, have your child draw a picture of daddy and write the word /label daddy underneath. Get out your Duplo and paint. Have your child do printing with the Duplo on paper. Draw or print an outline of a duck on paper. Let you child stick feathers or tissue paper on the body. Write D is for Duck/ d is for duck. what child does not enjoy stickers? Get out your sticker dots and give your child a cutout or printed D. Have them stick dots onto the letter. 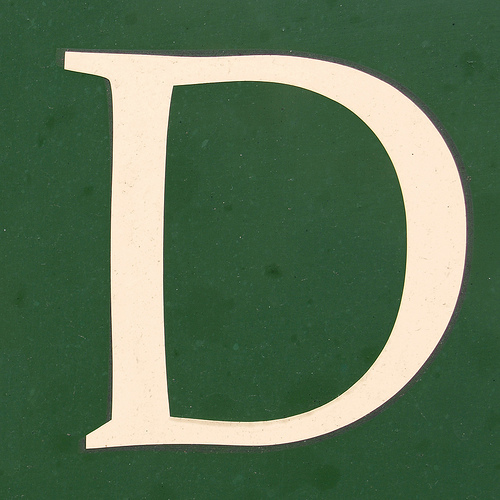 D is for dot. D is for dog. Role play with soft toy Dogs. Set up a vets area for your child to enjoy. Visit a shelter or pet shop and look at dogs. Take books out of the library about dogs, ducks, dinosaurs etc and read them together. Ask them to point at the letter d in the text whenever they see it/hear it. Make giant paper daisies out of paper plates and tissue paper. Look at real daisies and then paint daisies on large pieces of paper. You could even have a go at printing with them using the flower head. Cut pictures out of magazines of items beginning with d. Stick them onto a sheet of paper. find all pictures of animals beginning with d . Print them out and make a little booklet. use two old tissue boxes ( you know the ones you use to blow your nose with the holes in the top) paint them green and give them toes..you have Dinosaur feet to stomp around in!